“BRUNCH AFTER DARK” at Brooklyn Bowl on Nov 8! Thanks to all the bands who have played beautiful unplugged music in my backyard. And to my friends who have come to the brunches to support me. More importantly, to my production partners NYCTaper and West Egg Productions who have captured beautiful audio and video footage to create the episodes. Well now it’s time to celebrate and showcase 5 of the bands who participated in one way or another to BBS by going to my favorite place on earth: Brooklyn Bowl. All the info can be found in the below flyer including the event name “Brunch After Dark”, which my friend Gabe came up with. Hope to see everyone on NOVEMBER 8! Feel free to RSVP via Facebook. my name is dave. i write about music, culture, technology, and food. This entry was posted in Backyard Brunch Session, Just Confirmed, Live Music, Save the Date and tagged arms, backyard brunch sessions, brooklyn bowl, brunch, fatty acid, nyctaper, oh land, the canon logic, the courtesy tier. Bookmark the permalink. 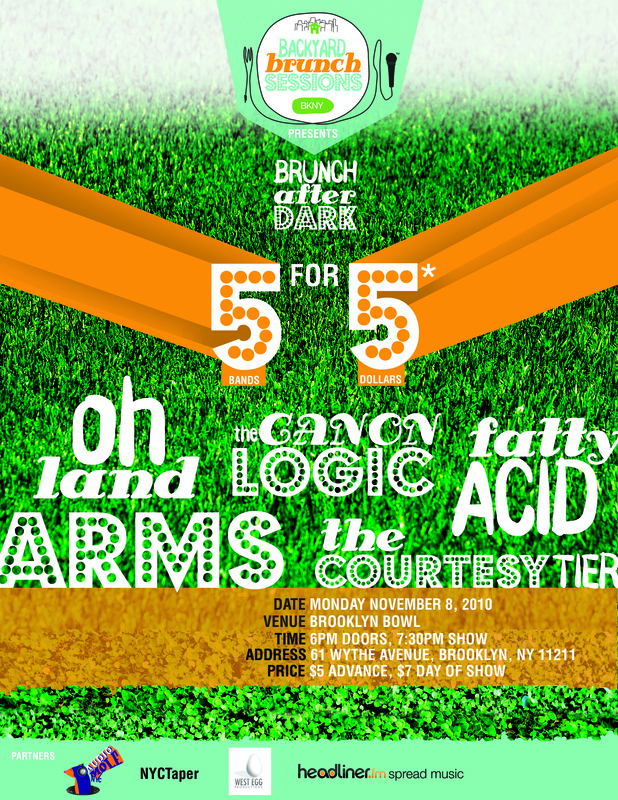 5 Responses to “BRUNCH AFTER DARK” at Brooklyn Bowl on Nov 8! Pingback: Oh Land ‘Sun Of A Gun’ For Orchestra #54 : FOR ORCHESTRA! Subscribe for email updates. Don't worry...I won't annoy you.